This entry was posted on Tuesday, April 9th, 2019 at 9:15 am. Civic award winners, Lieutenant Colonel Andrew Field; Lynne Vercoe from the Westbury Branch of the Wiltshire Family History Society and head teacher at Westbury Church of England Junior School, Richard Hatt with Mayor Ian Cunningham (with chain). THE mayor of Westbury, cllr Ian Cunningham, hosted the annual civic awards last week and made presentations to local people and organisations in recognition of their contribution to the town over the past year. 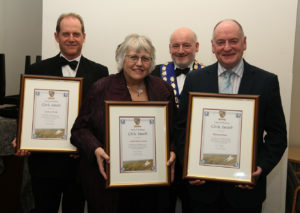 This year, awards were presented to the cleaner of the town’s public toilets, Linda Millard; town litter collector, William Phillips; head teacher at Westbury Church of England Junior School, Richard Hatt; community volunteer, Radek Evans; The Westbury Branch of the Wiltshire Family History Society; and World War One commemorations volunteer, Lieutenant Colonel Andrew Field; with a special mention to Poppy organiser, Bill Prior. Mayor, Ian Cunningham, presented each with their award, and the Deputy Mayor, cllr Mike Sutton, spoke about the work in the community of each award-winner. Pictured: civic award winners, Lieutenant Colonel Andrew Field; Lynne Vercoe from the Westbury Branch of the Wiltshire Family History Society and head teacher at Westbury Church of England Junior School, Richard Hatt with Mayor Ian Cunningham (with chain). Linda Millard; “Linda is one of Westbury’s unsung heroes. She has been cleaning the public toilets in Westbury for many years with 26 years’ continuous service under a variety of employers. Westbury Town Council became aware of her long service when we took over the care of the toilets after Wiltshire Council announced that they could no longer fund them and planned closure. “Andy Smith, operations manager – Wiltshire, at IdVerde said, “Linda has looked after the maintenance of the public conveniences and has always been loyal and hardworking, providing an excellent service to her customers. Linda was unable to attend the ceremony. “William Phillips; “Most people in Westbury have probably met Will Phillips as he pushes his sweeper’s cart around Westbury trying to keep our town a little tidier in the face of those who sadly persist in dropping litter and not clearing up after their dogs. He has been carrying out this task in Westbury for 17 years. William was unable to attend the ceremony. Richard Hatt; “Richard Hatt has been part of the furniture in Westbury now for 17 years as head teacher at Westbury Church of England Junior School. Those with long memories will know that it was a school in special measures when Mr Hatt first arrived and that it spent quite a few years in “requires improvement”. “The school has now achieved a (re)confirmed Ofsted rating of ‘Good’ and has recently topped national tables in subjects like maths, reaching the top 1% of some 20,000 schools in the government all import progress measurement; even this with children recognised as deprived reaching the top 5% against ALL children in the country. “Despite all this, Mr Hatt’s award is not just for his work at the school. A few years ago, Wiltshire Council decided to close our youth centre. Mr. Hatt and the governors at Westbury Junior eyed this empty building with interest. Radek Evans; “Radek has become a fixture in Westbury; whenever volunteering is needed Radek is usually there. In particular, he has made cleaning up and recycling waste at public events a special personal responsibility. He is currently heading up the volunteers at the community fridge. “Radek has practically single-handedly collected several petitions around subjects of concern to the town. He delivers flyers and leaflets on all kinds of important topics. “One if Radek’s great interests is music. He travels around the country helping out at all kinds of events, but he is also a stalwart member of the Westbury Festival committee, finding all kinds of interesting acts. Radek was unable to attend the awards ceremony. This year, the council also made a number of special awards to recognise those who have worked together with the council on the Great War commemorations. These were presented to; The Westbury Branch of the Wiltshire Family History Society; “Tonight, we are making an award to the Family History Society specifically for their huge project to research every man (and many women) who was involved in the Great War who came from (or were associated with Westbury). The award was accepted by Lynne Vercoe on behalf of the group. Andrew Field; “Lieutenant Colonel Andrew Field joined Westbury Town Council’s Great War task and finish group years ago. Since then, and despite being a serving officer, he got involved in all kinds of projects. He researched all the names on our war memorial which the town council then had restored. He has given a number of very popular talks on aspects of the world war. He has worked with us on projects including the trench with members of the World War 1 group. He even sourced a fully working model WW1 tank! “Andrew has been involved in all aspects of our World War One commemorations, even organising marches and wreath laying at the Remembrance service.